The range of applications for this – state of the art – taping is amazing! From swelling to soft tissue pain, every Massage Therapist needs to know how to do this. Your clients will really benefit from this 21st century approach to their injuries and conditions. 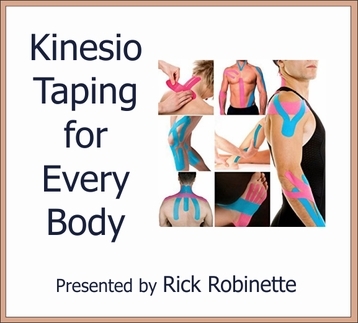 In this class you will be shown taping methods for problems such as; low back spasm, patellar tendinitis, rotator cuff tears, carpal tunnel syndrome, ankle or foot edema, and plantar fasciitis. set of sheets, face cradle cover, pair of scissor, Kinesio tape and wear/bring running shorts or comfortable shorts and females tank top or sports bra.